From top: Phisboro Tower; Surface parking to be left untouched; new student accomodation next to the shopping centre. 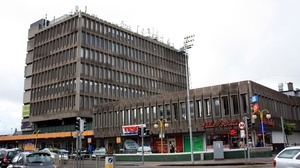 Phibsboro Tower, voted recently as the 2nd ugliest building in Dublin [after the now condemned Hawkins House], is to remain for future generations to enjoy. The Shopping Centre’s new owner has submitted an ambitious plan involving modern student housing blocks, new civic plazas and enhanced accessibility from the village. An island of dilapidated Continuity in the plan is Tesco Phibsboro (one of the most ancient and profitable branches in the country) who have apparently blocked a real effort to renew or replace the hated Tower and the masses of surface car parking, using their interestingly named “Tesco Covenant”: A legal veto against anything deemed to threaten their profits, the primacy of the car in Phibsborough, or local improvement. Does the readership know a single other large city centre development in recent times where surface parking has not been relocated underground? Seems like a real lost opportunity to properly modernise this site. Posted in Misc and tagged Phisborough, Tesco at 12:17 pm on April 11, 2017 by Broadsheet. I understand the push-back on any gentrification to the village, but by god, that really is a hideously ugly building. With a bit of a clean, some nicer signange, a tidy of the antennae on the roof and some landscaping and that building would look great imo. What are the plannign laws on signage bte? Actually that would make Dublin look instantly better. A requirement for all buildings to be washed/cleaned at least once a year. It’s harder for a place to look like a filthy kip if it’s washed. Good, and then in another few decades we’ll have had the time and space to properly appraise those buildings. Some of them will have become much loved. Others will have fallen out of favour. Don’t mind the building myself. I do mind the awful parking in front of it. Don’t think I’ve seen a carpark with such little room for manoeuvre anywhere else. All it takes is one piece of bad parking and it is chaos. I’m surprised at Tesco here, why they wouldn’t rather have a fully redeveloped car park that has more capacity and space for their customers. The current car park is just awful. As for the tower, if they can figure out a way to refurbish the outside ala The One Building, the fine, keep it. Otherwise it’ll be torn down and DCC/ABP will only allow a much less tall replacement. Do you get punched in the face often? You’ll get old (or less young as some might say) as well some day, and maybe then you too will get to enjoy occasionally forgetting words like shorter exist. Sorry, Matthew. Just joking, like. I’m not surprised by Tesco. I’ve worked with Tesco in London to demolish and rebuild a largish store along with a load of housing. They were really great about it, they had their own architects heavily involved. Might be just the local management are a bunch of penny-wise, pound-foolish muppets. The council needs to step in and CPO it, this is exactly the kind of thing compulsory purchase is for. One business cannot stand in the way of an entire community’s development. 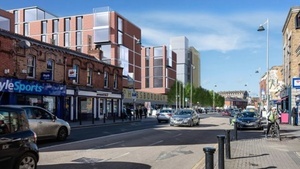 The new buildings look pretty bland to me from that render. I’m not sure what the justification for CPOing the occupied building is when there are so many properties elsewhere in the north inner city which are empty and falling into ruin? Are there any plans to give it a facelift? I don’t dislike brutalist architecture as such but it truly is horrific. They are going to wrap it in golden wire mesh on 2 sides like a big ferrero rocher, but that’s it. I like the new central bank. I like ferrero rocher too. The awfulness of Phis Tower will not easily be hidden in this way (indeed its outline will be expanded by this treatment). I really don’t get why they can’t put the parking underground, or why the council don’t force it. Hopefully somebody will do their job here. Ah phibsboro…..We need to nuke the entire area from space. Its the only way to be sure.